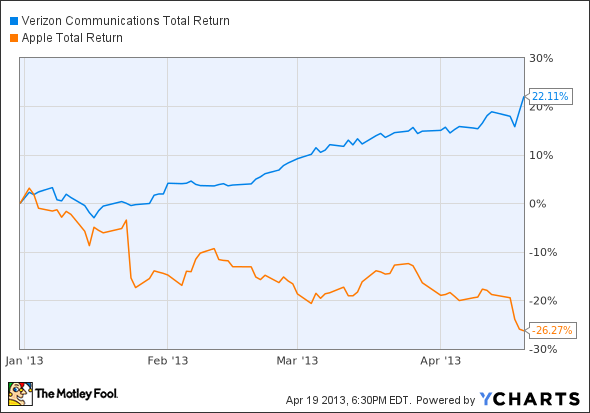 Verizon Communications Inc. (VZ): Why Is It Still Selling So Many Old Apple Inc. (AAPL) iPhones? 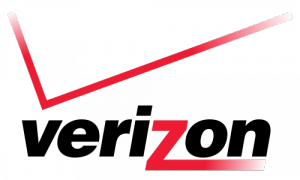 Without a doubt, Verizon Communications Inc. (NYSE:VZ) shareholders have to be feeling pretty good about themselves right about now. On the heels of the company’s strong quarterly earnings report last week, the stock has returned more than 22% so far this year when you include its beefy 4% dividend. Curiously enough, Verizon Communications Inc. (NYSE:VZ) also just told us that 4 million of the 7.2 million smartphones it sold in the first quarter were Apple’s iPhones, and facing competition from the likes of Samsung with its massively popular Galaxy series devices, to take home more than half of Big Red’s total smartphone sales is no small feat. Unfortunately for Apple Inc. (NASDAQ:AAPL), just half of those 4 million Apple Inc. (NASDAQ:AAPL) devices Verizon Communications Inc. (NYSE:VZ) sold were iPhone 5s, with the remaining half consisting of the older iPhone 4 and 4S models. Of course, that’s consistent with last quarter’s split, when many investors had thought (or hoped, rather) that the iPhone 5 was simply in short supply. Yet here we are looking back at another 50/50 split in Q1, when Apple’s fresh supply of iPhone 5s should have had no trouble keeping up with demand. So does this mean consumers are underwhelmed with Apple Inc. (NASDAQ:AAPL)’s latest offering? That doesn’t do much to reassure nervous Apple investors who are praying for a blowout quarter to turn things around. Then again, while this all seems to show that consumers aren’t particularly compelled to pay up for the iPhone 5, the fact so many people want an iPhone at all — new or old — undoubtedly shows impressive interest in taking part in Apple’s world-class software ecosystem. After all, when so many people we interact with on a daily basis already have Apple Inc. (NASDAQ:AAPL)’s products, network-effect-based applications such as iMessage and FaceTime start to look a whole lot more interesting. Take me, for instance. A few months ago, I was just itching to get rid of my buggy old Research In Motion Ltd (NASDAQ:BBRY) Bold smartphone after nearly two years of frustration with its subpar ecosystem, slow download speeds, network outages, and botched software update pushes. While I knew Research In Motion Ltd (NASDAQ:BBRY) had bigger and better plans going forward, the fact remained that I had little faith remaining in the company’s products or infrastructure. Google Inc (GOOG) Fiber Puts More Pressure on Cable Apple Inc. (AAPL) iTV: The Absurdity Continues Apple Inc. (AAPL) Losing Power On the Market, But Also Off It? Apple Inc. (AAPL), Wal-Mart Stores, Inc. (WMT), and Why You Pay 235 Times More... Apple Inc. (AAPL), Intel Corporation (INTC) And Three of the Cheapest Tech... Apple Inc. (AAPL): A 4-Wheeled iPhone Due in 2014?